May the good Lord shower you with faith and understanding so that you can withstand a congested facility where the air of rehabilitation vanished with every issue of alleged VIP treatment accorded to anyone serving or doing time. Every prison officer now must not smile at anyone, never mind if it would bring forth hatred. That way, no body gets suspected of directly or indirectly conferring special treatment on anyone. If there is maltreatment as a consequence of the sensitivity of people on conditions obtaining in prison, then so be it. Never mind if the world would look down on them as retributive and vengeful. Never mind if the universe would assume that they have never transcended tribal instinct. The point is: there is no other treatment that would allow prisoners to be human anyway. We would likewise understand how hostile you could be. You may for sometime during the period of your incarceration harbor the thought of getting back at society, on imposing the cruellest means of hardship you can express on people but please, focus only on those who made your life miserable. Just bite your fingers and wait. Once you are released, it would be your turn. Look for those who made you as you were. You can find them almost everywhere. As they made you a game before, you have the option to do some karmic procedures on them eventually. Don’t look at your future says one who was released on acquittal after 10 years. It would be wiped out along with your reputation and integrity while you serve time. You know what? The only period left for you is to get back at your tormentors. Don’t even listen to your conscience. It has faded in the din of labels, stereotype and catcalls you have been inured at being thrown on you. Don’t even think of repentance, it was merely a promise that broke as soon as you were shoved inside the stinking four walls. Forget hope, it will only foster insanity. Strike at the very heart of those who made you the way you are right now. “Vengeance is mine” says the Good Book, but you must sow it first. It would take years to keep your rage burning. Let it ignite your resolve and keep you warm in a cold place sometimes called hell. It will keep your mind keen and your soul alive. Those who passed through this layer maintained that you need hatred to fill those insane moments of gross routine and familiarity. You need hatred to survive. Hatred will consume everything that deceives you in the course of imprisonment. It is healthy. Note that everything in prison is the reverse of anything in the free community. What is good outside is definitely bad inside. Love is only useful for those with freedom, hatred for those without it. On your first day, accordingly, you must swear to high heavens for strength and fortitude. The past will accompany you up to the last minute of the day. This would be repeated daily up until your penalty is through. There is no present tense in prison, there is also no future. Everything belongs to the past. Time while under incarceration is frozen. It cannot be thawed by prayers; it cannot even be melted by miracles. Only death can erase its meaning. Yours or that of others. For those who harbor guilt, this is your universe. And Oh, by the way, jail time is not imprisonment yet. It is temporary and called detention. For those who are still in jail awaiting the final verdict of the court, those under custody of law are referred to as “detainees.” It is only when conviction is handed down that a detainee becomes a prisoner. That is the time when the court will issue a commitment order or mitimus addressed to the Director of Corrections for the admission of the person for service of sentence. While under detention, one is still technically “innocent.” Except to move out from the detention facility, the detainee is free to seek any privilege he may want to enjoy, provided it is allowed by the detention facility. Discretion, at times, is the order of the day. There is however another rule, which the detainee may also consider. By signing up for “working detention,” he may opt to credit the period of his detention to be carried over to the next computation of his sentence once he is admitted in the penitentiary. 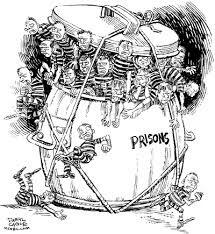 The crux however is that he must comply with every jail or detention rule as if he is already a prisoner serving time. This means that he will have to wear the facility prescribed uniform, comply with regular headcount, acquire the mandatory regulation haircut and observe all related routinely defined activities. In my three decades in the prison service, I have witnessed and taken note of all behavioral and emotional manifestations of all persons passing through the regime of incarceration. This is from Day One to the Last Day in the facility. I know the ups and downs, the high and low of the prison community. I have seen how laughter is expressed, how sadness is manifested. It is a leveled playing field. Everyone is fair game. It is a community that ignores distinction. Discipline is a state of mind. An inmate can be good or bad; his personal choice. It cannot be dictated and enforced institutionally. You will go through these in the course of your immersion. No one is exempted. Prison officers, on the other hand ,are only as good as the walls and barbed wires that surround the facility. Don’t count on them for consolation. They must be cold and neutral. To be human is to be suspected. To be inhuman is to be acceptable generally speaking. Another reminder and please bear this in mind: Prison service dehumanizes everyone: from inmates to workers. That is the reality. If one day you meet someone who retired from prison work or has been released and still there is a smile on his face, look closely; either the fellow is an alien or one who is about to be a Saint! Posted on June 24, 2014, in Uncategorized and tagged detention facility, incarceration. Bookmark the permalink. Leave a comment.